Grab your umbrella! 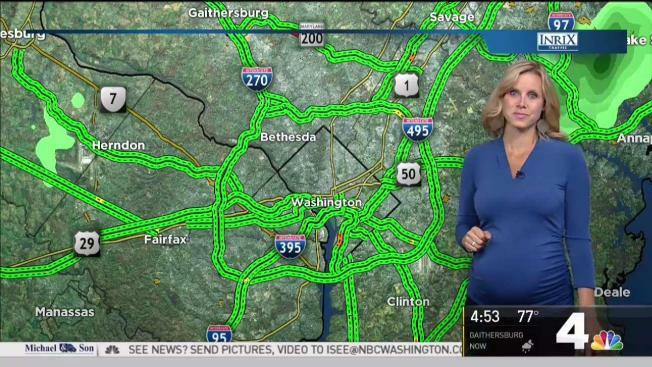 Rain will fall across the D.C. metro area for much of your Friday morning commute. Storm Team4 says the heaviest rain should stop about 10 a.m., but showers will stick around all day. A flood warning has been issued for Stafford County, Fredericksburg and Spotsylvania County. A flash flood watch is also in effect for parts of central Virginia, and Storm Team4 says that watch could be expanded to include more of the D.C. metro area later in the day. The region could see between .5" and 1.5" of rain. Virginia will see most of the rain, with Maryland getting closer to .5" of rain. The rain will continue into the weekend, with rain falling Saturday morning. Storm Team4 says a round of thunderstorms is likely Saturday afternoon, but the entire day will not be a washout. The hot and humid weather will return Sunday, but there will still be a chance for a few scattered storms in the afternoon. Sunny weather returns at the beginning of next week.